“One, two, three – Clever Bear counts with me!”. 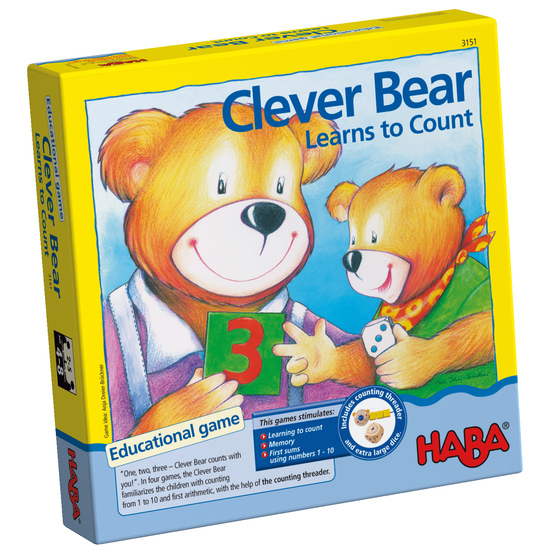 In four games, the Clever Bear familiarizes the children with counting from 1 to 10 and first arithmetic, with the help of the counting threader and the dice with symbols or numbers. Contents: 1 Clever bear's counting threader, 1 die showing numbers, 1 die showing hands, 1 die showing dots, 40 cards, Set of game instructions.